bundle logout, profile, account – have them dropdown. groupname.domainname.org – like ning you would log into this and you would basically only be within the group, there would be a way a user could move to the more complex, multi-group/network crabgrass view. 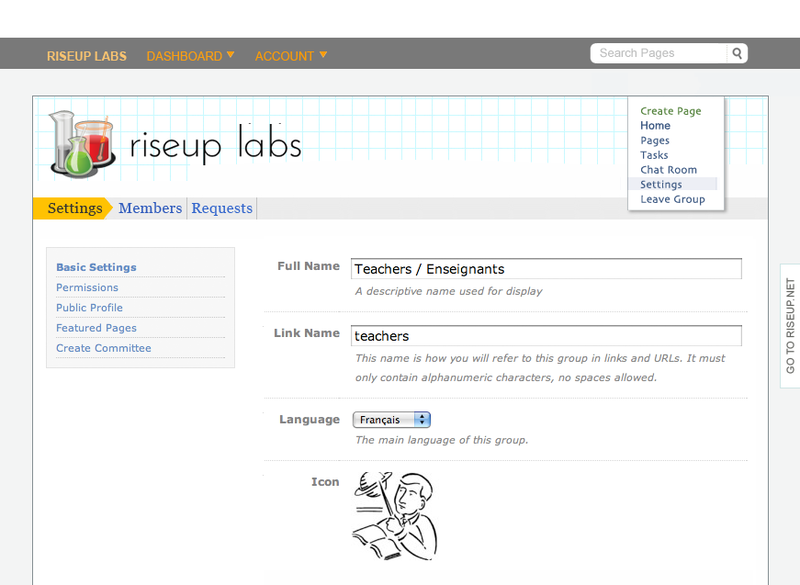 it would be good if we.riseup.net users could also have the crabgrass-lite version. 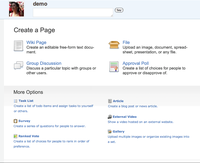 highlight only discussion, wiki, asset, and rate many poll when you go to create a page, have the rest below these and smaller. I like changing Me —> Dashboard. We have had many report backs from users asking about “me”. Its not self explanatory. Also, if we shift to “your world” now we are having you and me in the nav referring to the same person. when the user goes into the bigger world the global nav gains the sitehome, directory links. the single group link changes to “your world”. 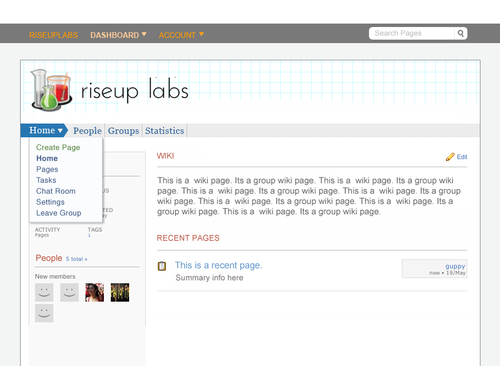 put a “my world” global nav drop down for quick links to friends, groups, and networks. so, here are some more cglite mockups. obviously this is proposing a new theming. i’m sorry to conflate work. but i was really having a hard time working on cglite with the 0.5.3 nav. my work just started morphing. i think the theme i have now is clearer in some ways, but i’ve also been looking at it too much, so maybe its not. either way. the cglite specific ideas can happen with 0.5.3 theming if we want. no masthead. 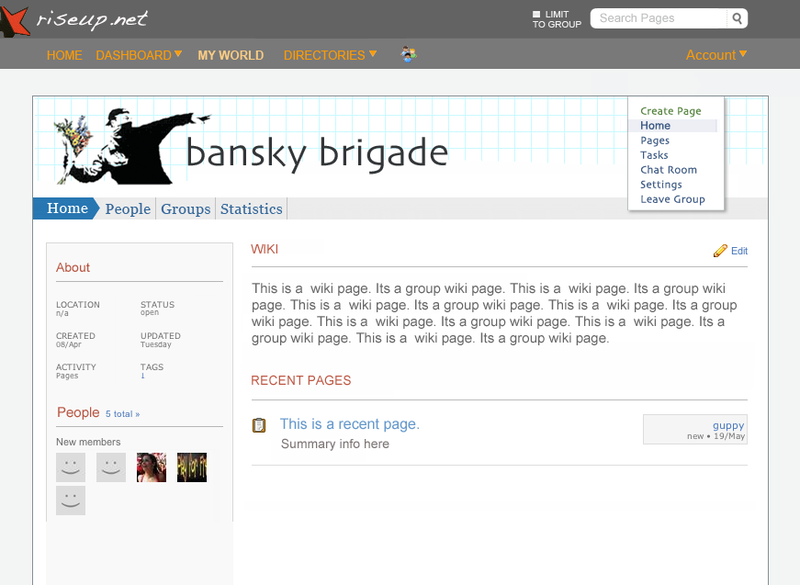 group banner, within the group section, becomes the branded space. 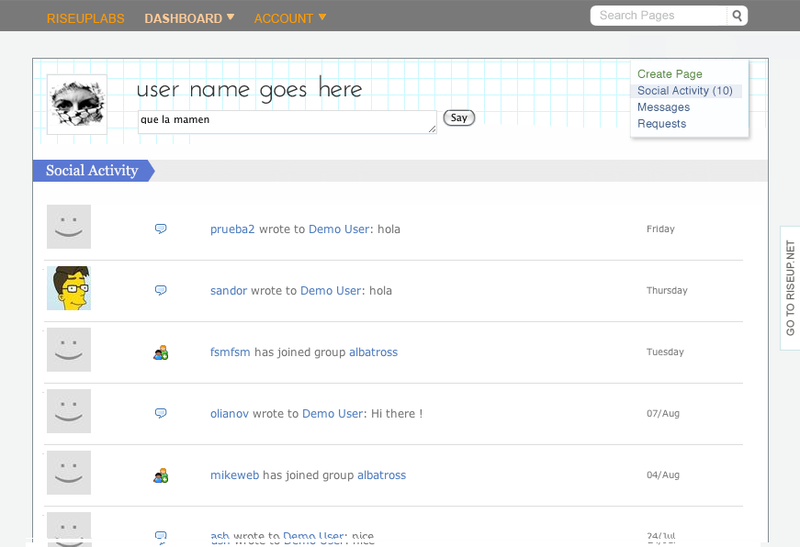 the global nav is stripped down to dashboard, your group and account. carrots in masthead for clarity. 2nd level nav, shown below in the banner, as a drop down of the arrow sign posts. looks very clean, but nav in a drop down and also having the sign post play two roles might not be a good idea. This is just normal cg without the me/pages section. For now we will not limit full cg. 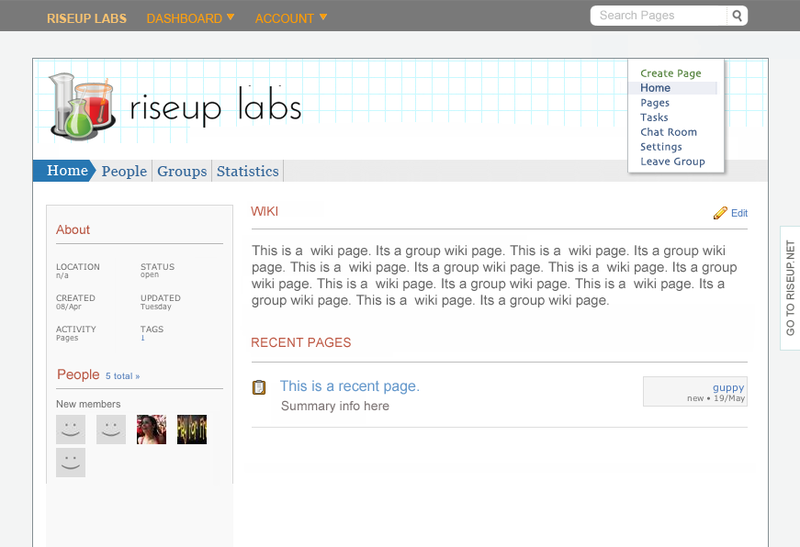 if i have time i will upload a mockup with me/pages in it and without the “multi-group” button. for now just imagine it. people, groups, networks combined into “directory”: for phase 1 they will resolve to the each section, as they do now. Basic version: what happens when someone shares a page with you, what happens when someone notifies you of a page, if there is no me section? one solution would be to have the notification show up in messages, and if i share a page with you you get a message that says daniel shared a page with you. you would click on the page an go to the group. 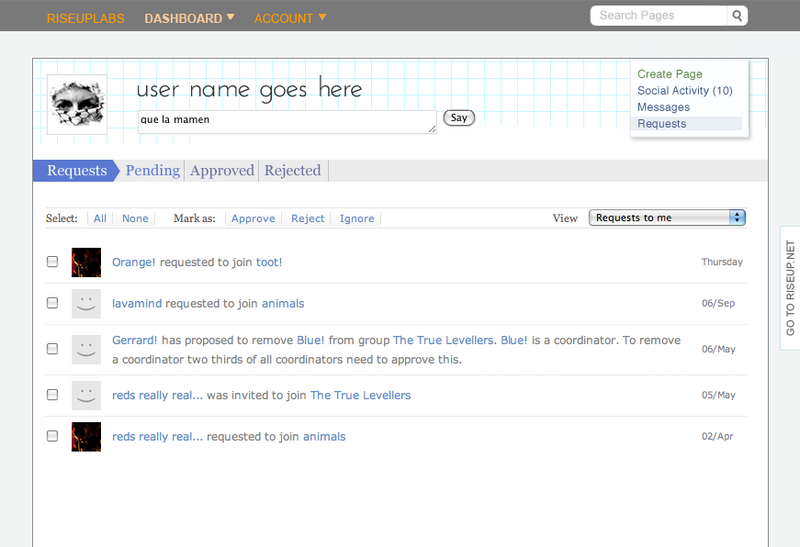 as per azuls comments, the group page needs tweaking. the mockup as of sept 9th has the group name mentioned 3 times. in the me-section there is no pages feed. to see pages you go the group. 2) crabgrass full version – basic view. 3) crabgrass full version – multi-group view. the user can now access all their page activity across groups from the me-section. they get the refinements and ability to sort pages that the me-section provides. the user no longer has as much reason to go to the group section. i like the term “home” as an alternative of the confusing “me”, car-centric “dashboard”, and metaphor-compromising “your world”? i like the idea of cg being easily customizable, to make the clean, simple, “lite” version appropriate for the specific anticipated use in each particular install. i think it’s weird for the ‘Me’ dropdown to refer to me in the first person but the ‘your world’ dropdown to refer to me in the second person. can you view another user’s profile? and if so, what do you see if users don’t have page views? i agree. 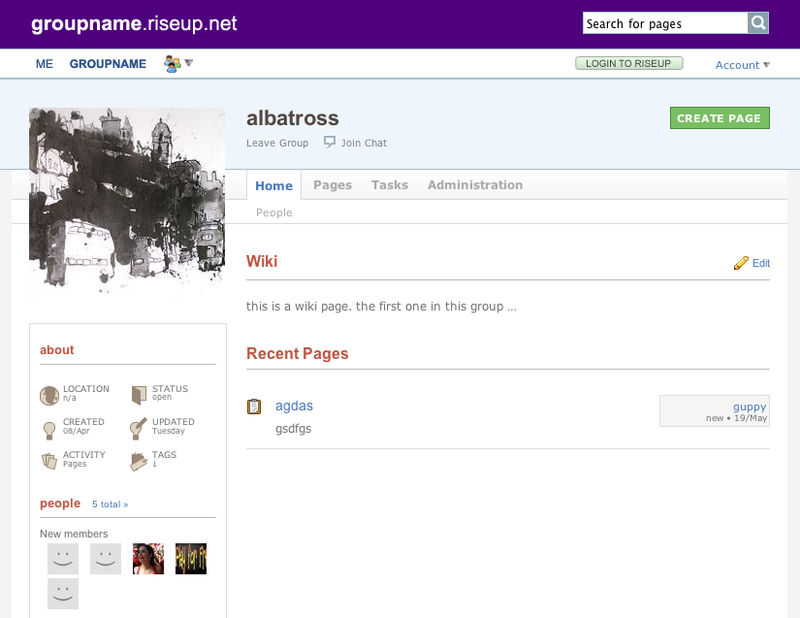 i change “me” to “dashboard” in the recent mockups and change “your group” to “riseup labs”, the actual name of the group in the lite version. i’m confused. 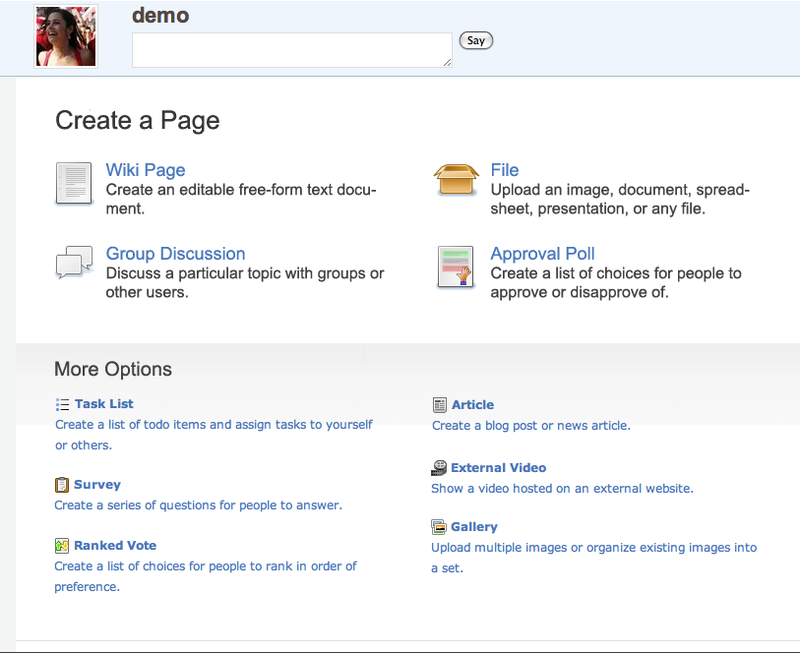 what do you mean users dont have pages. 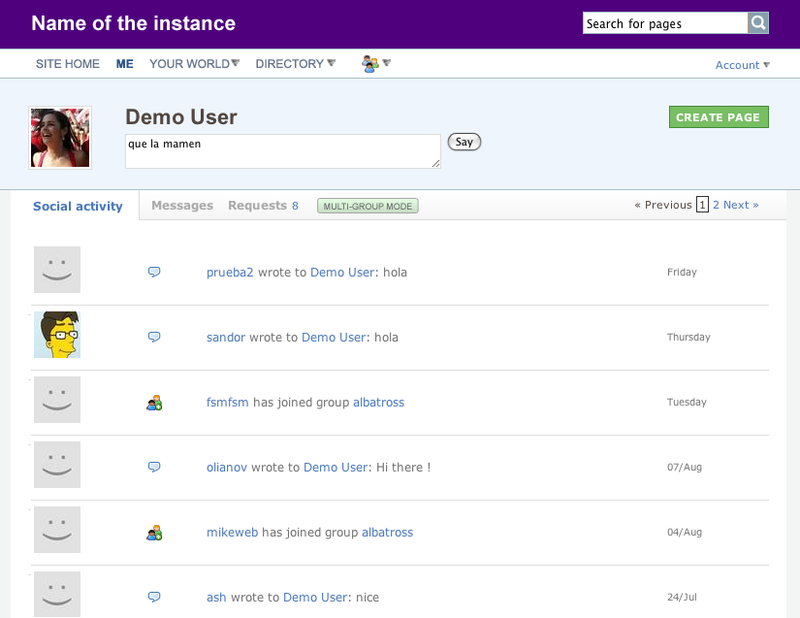 i am only suggesting that in lite, there is no me/pages (dashboard/pages) view. there would be a way to goto /kclair. it would behave the way it does currently. the missing part is what global nav link would be active.